The Bologna Process instituted measures promoting common curriculum throughout Europe with three-year standards established for Bachelor programs in economics, humanistic and positive sciences, and four-year standards for engineering sciences. Dramatic reductions were made to programs resulting in students moving into the workforce at a faster pace and with fewer academic credits. Questions existed as to whether three-year programs were sufficient for professional identity development. Professional identity, a system of attributes and values one has about self in relation to professional role, is essential for professional culture integration. This chapter employs a quasi-experimental design to compare professional identity development of Romanian business students ranging from first- through third-year using 2012 data and fourth-year students using 2007 data. Findings reveal professional identity within post-Bologna Process programs rose from first year to second but fell in the end-of-program third year. Data from pre-Bologna Process programs show higher measures of professional identity for end-of-program fourth-year students. Interpretations are provided and student workforce readiness discussed. Adoption of a system essentially based on two main cycles, undergraduate and graduate. Access to the second cycle shall require successful completion of the first cycle studies, lasting a minimum of three years. The degree awarded after the first cycle shall also be relevant to the European labour market as an appropriate level of qualification. The second cycle should lead to the master and/or doctorate degree as in many European countries. After the meeting in Berlin, the higher education framework has been finally decided to contain three levels: undergraduate, master and doctoral studies. Thus, addressing a need for compatibility, comparability, and convergence of degree structures, the European countries promoted through their national parliaments a new legislation. In Romania, this new higher education structure has been promoted in 2004, although master programs existed before as an optional direction for continuing university studies. The educational model was restructured to provide degrees in three cycles: the Bachelor’s degree (three years); the Master’s degree (two years), and the Doctoral degree (three years). This structure is valid only for classical fields of science, economics and humanistic studies. For engineering studies, the undergraduate programs run for four years. Shortening lengthy first-cycle degrees without sacrificing academic and pedagogical rigor proved a concern for most university programs. First steps for many academic programs included identifying and deleting “fluff” courses, realigning program standards and competencies within collapsed courses, improving curricula design within courses and programs, advancing an appreciation for student-centered teaching concepts, and introducing/ implementing effective quality assurance measures within courses and across programs. Does professional identity increase as student’s move through a bachelor’s degree program? Does the professional identity of third year end-of-program students differ from the professional identity of fourth year end-of-program students? Experiential Learning: Experiential learning activities provide the opportunity for students to apply content knowledge and practice newly learned skills within the real world setting. Information and skills that have originally been learned within a linear format and structure may now be applied within the context of the non-linear world. Professional Identity: A system of attributes, and values one has about self in relation to professional role, that is essential for professional culture integration. Stage Theory: Stage Theory asserts that elements within a system move through distinct, well-defined stages, and that these stages can be described based upon specific, distinguishing characteristics. Work-Integrated Learning: Work-integrated learning (WIL) scholars maintain that universities hold a key role in professional identity development of students and assert that professional identity formation constructs should be embedded within academic curriculum through intentional work role preparation activities and workplace learning experiences, thus providing a critical link between current learning and future work roles. 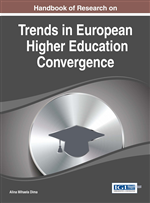 Bologna Process: The reforming European Higher Education initiated by the Bologna Declaration signet at June 19, 1999, in Bologna, by ministers in charge with higher education from 29 countries. The aim of this process has been to create the European Area of Higher Education, an area of comparable and compatible higher education systems from all European states. Tacit Knowing: The process of learning through direct experience, when we acquire knowledge through perception without being aware of it, and only through association with events we are aware of we learn about this knowledge. Social Identity Theory: Social identity, described as that part of an individual’s self-concept derived from perceived group membership, is grounded in perceptions of group status differences.